Adult kids living at home? Chances are they’ll still be there in ten years time. Australians are living with their parents longer and longer, and prospective empty-nesters might be pulling their hair out if they saw the latest data. Just 48.2 per cent of people aged 18-24 in 2001 moved out of their parents home by 2011. And what’s more, 8 per cent of those aged 25-29 in 2001 had moved back in with their parents by 2011. The data come from HILDA, an absolutely amazing study by the good folks at the University of Melbourne. It follows thousands of people through their life, to deliver data that are richer than the regular snapshots from the ABS. The trend is global and its causes are probably economic. 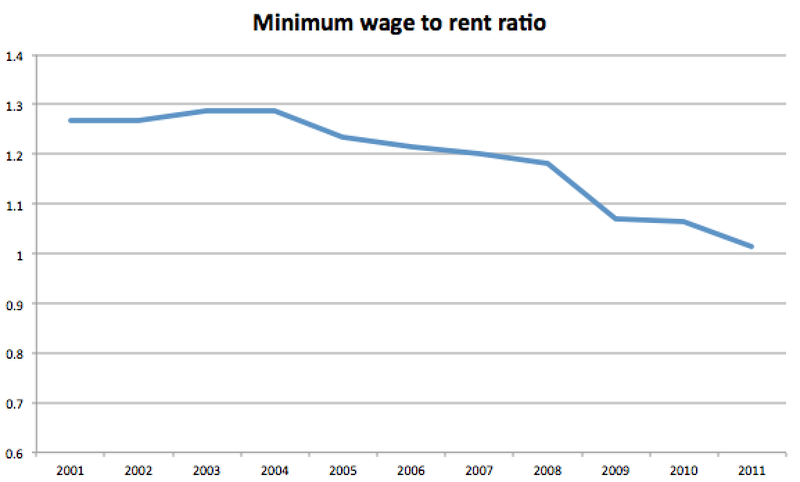 The ratio of minimum wage to rent suggests moving out of home is hard. I would have done the above graph for house prices too, but the line would go down so fast you’d have to scroll a long way to see it all, and I don’t want my readers getting RSI in their scrolling fingers. Anecdotally, high house prices pin kids to the parental home in another way too. To buy a house you need a deposit. The best way to save for a deposit is to stay at home for a long time (or return home – this generation is called the boomerang generation for a reason). That’s not all. While trying to save, kids are also worried about student debts. 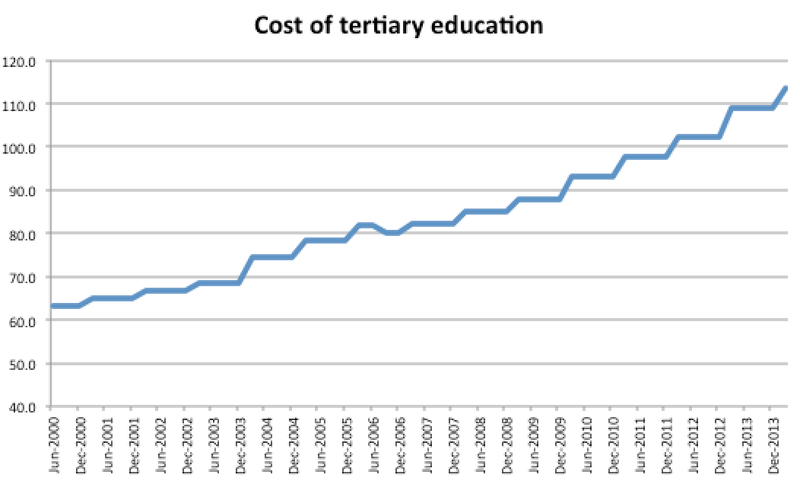 The cost of university has also doubled in the last ten years, far exceeding the rate of inflation. 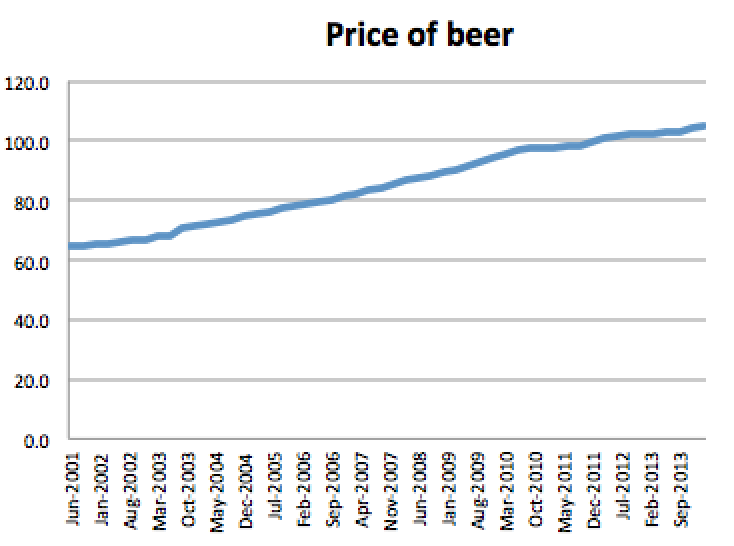 Incidentally, the price of beer has shot up too, and given how much of my student budget went on that, I’m glad I attended university over a decade ago. For wealthy people from wealthy families, living at home is a simple matter of balancing material comfort against mild embarrassment. Kids who choose to live at home are a grand source of humour and pensive Guardian opinion pieces. But really, the option is a blessing for those of us whose parents have stable housing situations. Not everybody is so fortunate. That’s why policies like the Government’s plan to force under-30s to look for work without the dole is so ignorant. Not everyone has a spare room to go to, with their pictures still hanging on the wall. Previous Previous post: Best technology news in weeks: Electric car maker Tesla opens up all its patents. Next Next post: a+b=c. Algebra can save a poor black kid’s life.